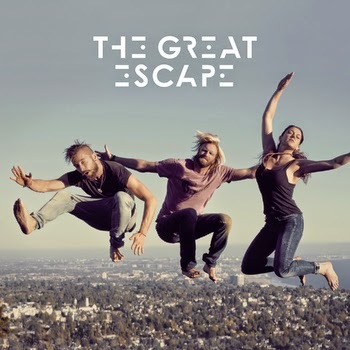 The Great Escape have released their debut album The Great Escape. This Los Angeles trio look pretty surf, but their music is far from that. Expect to be blasted-off quite literally from the start of the first song All I Think About, however the next song Rebel just continues the bursts and hooks from the guitars, through to the horn section. The Secret Song is a fairly folkish track, which throws you off at first but then you realise they're talented enough to pull this change of direction. I Want It All is another twist to The Great Escape as it's all Big Swing and boogie woogie blues piano that drives this song of acquiring as much as possible. The band make a point of melting '60's & 70's music into a modern format and It's Getting Better just fits their vision very well. For some reason Let's Go seems a perfect song for driving one of those big American convertible cars down the highway with this song cranked-up to max twenty! Another surprise track Put It On Ice is full of soul and funky hooks, and even has the deep male voice to add to the boogie groove in this song. Returning to the folk and acoustic dimension of the band is a very reflective song, I Just Can't Help Myself.